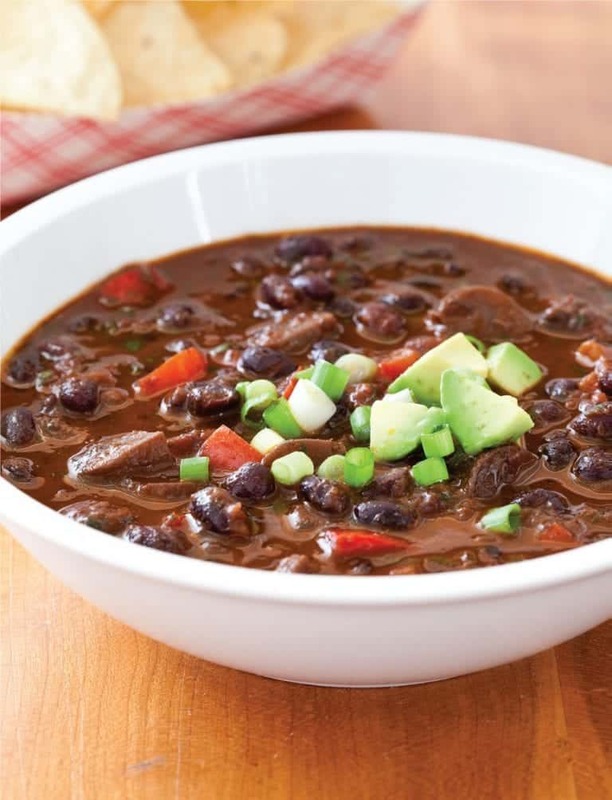 Vegetarian black bean chili is tricky since you can’t use the smoky ham hock or bacon that you typically find in non-vegetarian versions. For flavor without the meat, we browned a good amount of aromatics and spices and made sure to use flavorful dried beans rather than canned. The pressure cooker cut their traditional cooking time in half. Soaking dried beans helps prevent them from bursting, but here we opted to just rinse them since broken beans helped thicken the chili. Serve with your favorite chili garnishes. 1. 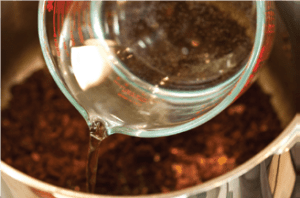 BUILD FLAVOR: Heat oil in pressure-cooker pot over medium heat until shimmering. Add onion and cook until softened, about 5 minutes. Stir in chili powder, cumin, garlic, and chipotle and cook until fragrant, about 30 seconds. Stir in broth, water, tomatoes, beans, mushrooms, and bay leaves, scraping up any browned bits. 2. 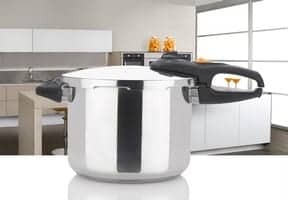 HIGH PRESSURE FOR 45 MINUTES: Lock pressure-cooker lid in place and bring to high pressure over medium-high heat. As soon as pot reaches high pressure, reduce heat to medium-low and cook for 45 minutes, adjusting heat as needed to maintain high pressure. 3. QUICK RELEASE PRESSURE: Remove pot from heat. Quick release pressure, then carefully remove lid, allowing steam to escape away from you. 4. BEFORE SERVING: Remove bay leaves. 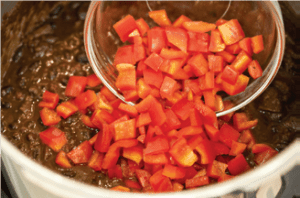 Bring chili to simmer, stir in bell peppers, and cook until tender, 10 to 15 minutes. Stir in cilantro, season with salt and pepper to taste, and serve. Stir 3 tablespoons tequila into pot with broth. Stir 1 tablespoon tequila, 1 tablespoon honey, 1 tablespoon lime juice, and 1 teaspoon grated lime zest into finished chili with cilantro. Add 1 zucchini, quartered lengthwise and sliced 1/2 inch thick, 1 cup frozen corn, and 1 large chopped tomato to pot with bell pepper. Simmer as needed to thicken before serving. Omit mushrooms. Add 1 pound kielbasa sausage, sliced 1/2 inch thick, and 8 ounces andouille sausage, cut into 1/2‑inch pieces, to pot with broth. We usually salt-soak beans, but here the extended cooking time of unsoaked beans means we have more time to develop flavor, and more busted beans gave the chili a thick texture. 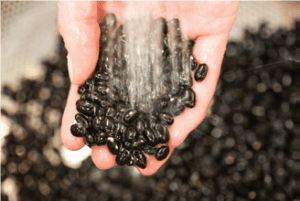 Before adding the beans to the pot, pick through the beans to remove any stones, then give them a quick rinse. 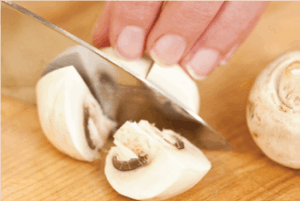 To give this chili a deeper flavor, we rely on the umami quality of mushrooms. This savory flavor is produced by an amino acid known as glutamate, which mushrooms happen to have in spades. One pound of mushrooms adds a savory hit to this chili. To keep this recipe vegetarian, we rely on equal amounts of vegetable broth and water for the liquid component. Cutting the broth with water prevents the soup from tasting overly sweet and tinny. 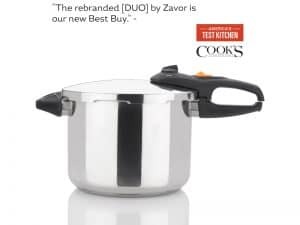 Not if you are using a 6‑quart pressure cooker; it won’t fit. 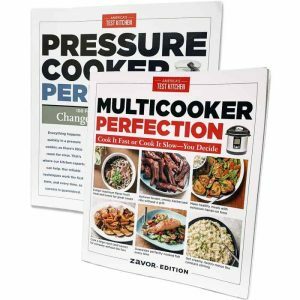 For an 8‑quart pressure cooker, you can increase the recipe by half. Follow the same procedure. but increase the simmering time in step 4 to 25 to 30 minutes. 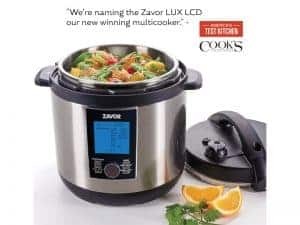 Do I need to alter the recipe for a 6-quart electric pressure cooker? Yes, quick release the pressure immediately after the pressurized cooking time; do not let the cooker switch to the warm setting. Increase the simmering time to 20 minutes in step 4, and use the browning (not the simmer) setting.